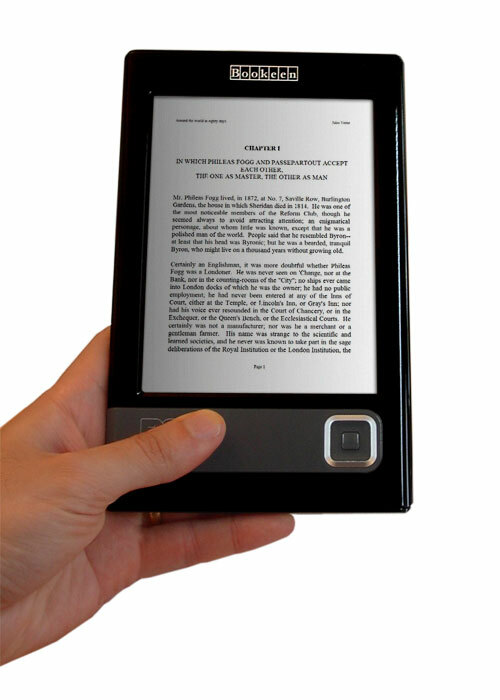 The top electronic readers today utilize this new high-resolution display technology called electronic paper. 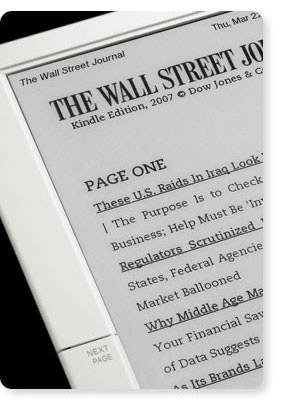 From Kindle, to the Sony PRS-505, to the Hanlin eReader Series, among others… all are now using this revolutionary e-ink technology. It provides a crisp black-and-white screen that resembles the appearance and readability of printed paper. The screen works using ink, just like books and newspapers, but displays the ink particles electronically. It reflects light like ordinary paper and uses no backlighting, eliminating the glare associated with other electronic displays. 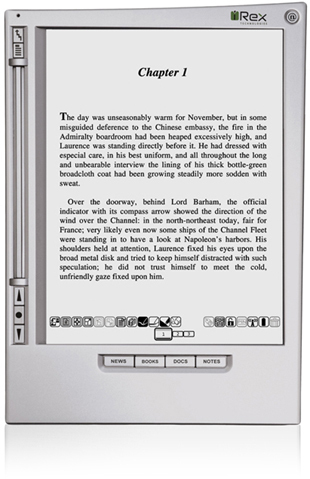 As a result, these electronic reading devices can be read as easily in bright sunlight as in your living room.The screen never gets hot so you can comfortably read as long as you like. Many are now lighter and thinner than your typical paperbacks, and fits easily in one hand. Their built-in memory stores hundreds of titles and provides space for optional SD memory cards that allow the device to hold even more content. Most offer access to online stores that are associated with the parent company. Some even allow you to back up your content on the your computer or the companies media center for future download. Backing up your content this way allows you to make room for new titles on your device. Some devices allow wireless content delivery to your device, Amazon’s kindle, for example, utilizes Sprint’s national high-speed (EVDO) data network to enable you to wirelessly search, discover, download, and read content on the go. Others like the iRex iLiad, utilizes WiFi technology, which is a little bit more restricted to “hot spots.” Of course, all of this wireless content access is free. Other devices such as the Hanlin and the Sony PRS series uses a USB/Computer combination for content download. So what’s best for you? It really does depend on where you are and what resources you have access to . For example, even though Amazon’s Kindle provides wireless coverage, it doesn’t cover the entire United States, nor is it available beyond US soil. This is just my personal opinion but I believe that technology is so ingrained in our society and has taken such a strong-hold on us that I cannot see the future without a “good” electronic reading device in almost everyone’s hand. Just the simple thought of having a huge amount of content at your fingertips is something that simply cannot be ignored…think about it. I know that the majority of people have not yet caught on, but I think that when they do, you will see a surge in the usage of electronic reading devices. Right now the battle is on for who will provide the standard device and it will be very interesting to see who comes out on top. That said, if you do decide to get one of these interesting devices, always remember to do your due diligence before you buy. After spending months with my Kindle, I ‘ve found the following to be true. kindle‘s is as good as advertised except in a few minor areas. Thus far, I haven’t had to sit in front of the computer to download anything. All my content comes straight to me wirelessly in under one minute just as advertised – No hype there. Also, Amazon have so much interesting content, that I hardly need to go anywhere else…not to mention the fact that more is being added every day. Reading now is as close as a click to buy, click to download, and a click to read…that’s it. I mean in under one minute, I can enter a whole new world. All I have to do is grab my Kindle, press the “Alt” and the “A” key simultaneously to kick start it and I am there. And what if I have a question while using my Kindle? Easy…I can just access the NowNow feature and ask my question or I can do a search in the Kindle guide which is right there on the device…and in no time I get an answer. As for content, I like the idea that I can browse the Kindle store and read samples before I decide to buy. Thus far, I have bought a number of books this way simply because I was able to read sample. It’s just like going to a book store and browsing through to see what the book is all about before buying…Good Job Amazon. What about battery life? Well, It doesn’t last as long as advertised, but it last long enough for me to take my Kindle with me and read for a couple days for about 3 -4 hours a day without recharge. And that of course depends on the font I use. The larger the font, the more page turns I make, and the more page turns I make, the more power I use, which leads to a shorter battery life…that’s good enough for me. As for the newspaper, magazines, and blog download, I haven’t tried it. Honestly, I prefer to read my blogs free of charge on the computer, considering the fact that I have to pay for the feed. As for the magazines and newspaper, I haven’t had the need to get in on it yet. Already, I have enough to read. I wish I could read every content out there, but honestly I can’t. But, when the need arises, I will try them out. That of course could be anytime soon depending on my mood. After all, it right there for the taking at the click of a button. Some other features that I love are the the word look-up, the bookmark, and the annotation features, They work like a charm…no complaints. In fact, I use the bookmark from time to time to find my place in a reading if for any reason I have to go somewhere else on my Kindle. I know that I don’t have to do this but I do it anyways. For me it’s the easiest way to get back to my place in the reading when I wander off somewhere else. I also like the fact that I can convert my personal files and have them downloaded to my kindle for a small fee… no sweat. And when I travel overseas, I just load up my Kindle with reading content and I can read for days…All I have to do is make sure I have my battery charger readily available. All in all though I am excited about this little device. I know there are others out there but for some reason, I am drawn to this one. Some say I am bias towards Kindle… and that’s okay…everyone is entitle to an opinion. No matter what though, I will continue to use my Kindle and tell others about it wherever I go. Wi-Fi or Whispernet – What’s Best For Kindle? By choosing to use the wireless Whispernet technology over Wi-Fi for kindle’s data transmission, did Amazon make the choice? To answer this question, let’s look at each technology in detail. What is the WiFi Technology? Wi-Fi, short for Wireless Fidelity, is a term coined to represents a wireless technology designed to improve the inter-operation among computers within a network that cover a small geographic area known as “hot spots.” This technology operates within a set of standards (IEEE 802.11a or 802.11b) which are used to transmit data from an internet connection to a host computer within the 2.4 GHz and 5 GHz public spectrum. Any computer or PDA properly equipped with a wireless receiver in a “hot spot,” can access the data via this Wi-Fi network either for free or for a fee. The good news about this technology is there are “hot spots” just about everywhere. The bad news is these “hot spots” are normally confined to a very short distance from host located in homes, cafes, coffee shops, libraries, airports and other public places. This means that if you are not in a “hot spot,” more than likely you will not be able to access data via the Wi-Fi network. What is EVDO Whispernet ? EVDO, short for Evolution Data Optimized, is a wireless standard designed to provide high speed data transmission using the cellular approach. With this approach, a device can transmit and receive data via the same bandwidth or frequency due to its unique signature assigned by a complex mathematical technique. And, because the demand for bandwidth outweighs the amount available, it provides what seems to be the ideal solution for this kind of problem. Any properly equipped electronic PDA can receive and transmit data via this network as long as it is in a coverage area. Now, since Sprint and Verizon are the only two companies to have deployed this technology within the United States, coverage areas are restricted to their network areas. Thus far, there are no coverage areas in Europe, Asia (except for Korea) and other foreign countries…And that’s the bad news. The good news, however, is that once you are in a coverage area, you are not restricted to “hot spots.” Your device can transmit and receive high-speed data at will. So, what’s best for Kindle? Well, because of Wi-Fi “hot spot” limitation, the where and when of data transmission is severely affected. More specifically, if you find yourself outside a “hot spot,” you can expect data flow interruption. The whispernet network, on the other hand, is not restricted by “hot spots,” but, is instead limited by coverage areas. That’s not good for Kindle either. This, however is a different kind of problem. What do I mean? Well, regardless of which network you choose, Whispernet over Wi-Fi, you will still experience areas of data interruption. Whispernet interruptions, though, are far and few between, while Wi-Fi interruptions can be more frequent due to the short range coverage areas. So, the question is, would you prefer non-interruptions in a small area or non-interruptions in a large area? You make the call. As for me, I would prefer no interruption, but for now I will take the latter – since there’s nothing better right now. With whispernet, I will at least be able to move about freely with my Kindle on a large “piece” of real estate and not worry about data interruption as opposed to being confined one small geographic area at a time without data interruption. All I would need to do is know where the coverage areas are and act accordingly. So did Amazon make the right choice? I think they did, what do you think? The following is a detailed comparison between kindle and the iRex iLiad . 768 x 1024 pixels resolution, 160 DPI. Stylus (Wacom® Slim Pen) . 600 x 800 pixel resolution. The iLiad has a wireless connection to automatically download content and updates over the Internet. You can also connect the iLiad directly to any PC with a USB cable. The iLiad Companion software enables you to easily transfer and manage the documents between your PC and the iLiad. Simple to use: no computer, no cables, no syncing while in wireless areas. In non-wireless areas, PC/Kindle/USB cable combination necessary for content download. Expandable via USB, MMC or CF cards Memory Stick storage media – up to 4 GB of additional data. SD slot for additional storage varying capacity: 1GB, 2GB, 4GB… you choose.SD slot for additional storage. Optional external 10/100MB Ethernet networking via Travel hub. Syncs seamlessly with your computer thanks to the iLiad. If you are reading a book on your iLiad in the living room, while your computer is in your office. The iLiad Companion software brings them together using the built-in 802.11B/G wireless capability of the iLiad and your existing network. Your newspapers, books, RSS feeds and documents are synchronized automatically with your iLiad..
EVDO/CDMA Wireless modem connectivity enables you to shop the Kindle Store directly from your Kindle—whether you’re in the back of a taxi, at the airport, or in bed. Unlike WiFi, Kindle utilizes the same high-speed data network (EVDO) as advanced cell phones—so you never have to locate a hotspot. Computer connectivity necessary in non-wireless areas. Dowload quickly when in Wi-Fi hotspot. Synching between computer and device requires more time. Buy a book and it is auto-delivered wirelessly in less than one minute anywhere, anytime. Over 60,000 titles availabe from Project Gutenberg, and Mobipocket plus other free eBook sites. Subscribe to any of the international newspapers and receive your copy daily on your iLiad at the press of a button. Use as notepad or sketchbook and store hundred of pages with notes and drawings. Use the stylus to make notes, annotations, drawings or sketches. With the Mobipocket Reader Software you will be able to search, browse and discover thousands of RRS feeds from your favorite websites and blogs, subscribe and sync them to your iLiad and read them whenever you want. Your own reports, articles, reviews, and emails can all be transferred to your iLiad for reading, writing notes, making annotations, and sharing. More than 90,000 books available, including more than 95 of 112 current New York Times® Best Sellers and all New Releases $9.99, unless marked otherwise. More than 250 top blogs from the worlds of business, technology, sports, entertainment, and politics, including BoingBoing, Slashdot, TechCrunch, ESPN’s Bill Simmons, The Onion, Michelle Malkin, and The Huffington Post—all updated wirelessly throughout the day. Email your Word documents and pictures (.JPG, .GIF, .BMP, .PNG) to Kindle for easy on-the-go viewing. Free book samples. Download and read first chapters for free before you decide to buy. Internal memory hold up to 12 books, newspapers or comic strips. Long Life Rechargeable Lithium Polymer Battery. Leave wireless on and recharge approximately every other day. Turn wireless off and read for a week or more before recharging. Fully recharges in 2 hours. None just hit a Wifi hotspot. No monthly wireless bills, service plans, or commitments—Free wireless delivery so you can simply click, buy, and read. Includes free wireless access to the planet’s most exhaustive and up-to-date encyclopedia—Wikipedia.org. Computer Requirement: Needed for iLiad when syncing. Needed for Kindle only when in non-wireless area. Expansion: Both offers the capacity to expand and hold more content. Weight: Kindle reader a little lighter. Capacity: Kindle holds a lot more titles in internal memory even though its smaller. Battery Power: Kindle gives more out of fully charged battery. Fees: Not applicable for iRex, just hit a “hot spot.” Free Wireless in coverage areas. Accessories: Just about the same. Kindle ‘s EVDO technology allows you to download books, and magazines, blogs, and articles without the use of the WiFi- Technology. You don’t have to be near a WiFi hot spot to download. And if you are not in a wireless area, you can download stuff to your computer then transfer it to your kindle with a USB port. iRex iLiad requires you to be in a WiFi hot spot to access and download content…And if you are not in a WiFi “hot spot,” you can connect directly to the computer for content transfer. Both are interactive. With Kindle you can add you own notes, highlight text, clip text, search for a particular text or reading, and you can look up words in a built-in dictionary. With the iLiad, you can write, add notes, annotate, and share. Once you find your book on Amazon, you can download it in under a minute as long as you are in a wireless coverage area. Not so with the iLiad – you sync-up in a WiFi “hot spot” and download your content from the internet. With Kindle you a have the convenience of getting your Newspaper and magazines delivered in the morning when you wake up. iRex iLiad does not offer this service, even though you can subscribe to some international Newspapers. Both the iLiad and Kindle uses the same E-paper technology.Both support PDF to some extent, however, Amazon’s is presently experimenting with its PDF file accessibility. Both uses the computer to download files when not in a wireless area. iLiad: Dutch, English, German, French and Simplified Chinese. iLiad: Interactive note-taking and annotations with stylus pen. Annotated documents and notes can easily be transferred to a PC or another iLiad. Your friends and colleagues can also add remarks or edit your notes and return them to you. iLiad: Book edition launched early this month focuses solely on book reading. Have the capacity to hold a lot more titles when compared to the original iLiad…up to an additional 8GB from external memory. It also comes with 50 pre-loaded classics – including thrillers, romances, horror stories and comedy. Designed in a new sleek silver color. Kindle: No such dedicated book version. iLiad: With MyScript Notes, a stand-alone PC application, you can convert the handwritten notes you make on the iLiad into digital text that can be used with text editors, spreadsheets and e-mail clients. Kindle: No ability to make handwritten notes. How does kindle “stack up” with other electronic book readers such as the Bookeen Cybook, the iRex’s iLiad, The Sony e-reader, the RCA REB 1100, the Kohn, the Hanlin eReader, and the Easyread? Say what? You did not know there were others? Well, glad to enlighten you. Anyway, that’s not my purpose here. My purpose is to look into the Kindle crystal ball and try to figure out where it will end up. Will it fly off into the sunset of obscurity never to be noticed by the public again? Or, will it appear in every hand, on every desk, in every classroom, in every backpack, or in every purse? Will it travel to foreign countries far and wide”racking up” frequent flyer mileages beyond compare and eventually find itself in even the most remote crevice of the globe? Or, should we look for another? Well by now, if you have been paying attention, you should know that Kindle offers: wireless download of all its content in under a minute, electronic paper display technology, content in the form of 90,000 plus books, some Newspapers, numerous Magazines, and blogs, audio capability, and more…with a few drawbacks. But, what does the Cybook offer? . electronic paper- utilizing a breakthrough technology. Screen is based on the Vizplex electronic paper screen. Vizplex is the newest, fastest and brightest electronic paper display. Requires computer for content download – Connect the Cybook with the USB cable to any host computer and drag and drop your files. 2 GB – represents 10 000 standard books in Mobipocket, HTML or text. SD slot for additional storage varying capacity: 1GB, 2GB, 4GB… you choose. Computer connectivity in non-wireless areas. Much more time with computer/USB hook-up. Buy a book and it is auto-delivered wirelessly in less than one minute. 45,000 premium or 10,000 free titles from Mobipocket publishers. 300 standard books – 64 MB storage capacity. No monthly wireless bills, service plans, or commitments—we take care of the wireless delivery so you can simply click, buy, and read. Power Supply: Kindle gives more mileage. Capacity: The Cybook hold more books in internal memory. Kindle holds holds less books but make up for it with Newspaper, Magazines, and blogs. Fees: Not applicable for the Cybook since it does not use wireless. Superior for Kindle since it offers free wireless. Supplied Accessories: More for The Cybook, just a few for Kindle which of course is less cumbersome. Overall, this first generation Kindle is superior to the Bookeen Cybook, even with all its shortcomings. The fact that it offers wireless access to its contents, Newspaper, Magazines, and blogs puts it ahead. Yes, Kindle has its flaws which the “nay-sayers” are quick to point out, but, if you ask me, that’s good. After all, how else are you going to know what the public wants? That in itself is the kind of invaluable data that Kindle needed to move to the next level. Just stop, and listen… already the “true readers” are making suggestion about what features the second generation Kindle should have. I hope Amazon is paying attention. Think about it…Kindle with wireless access all over the globe, perfect display of PDF formatted document, access to thousands more books, all in under a minute…I really don’t think you can beat that. I dare say that this is an electronic reading device that has the potential to pervade the globe. But…wait a minute! Let me not get ahead of myself. That was just one comparison. How does Kindle stack up with the others? If you are planning to give kindle as a holiday gift, make sure you designate Kindle as a gift at checkout. That way, when the purchase is complete, the device will not be registered to your Amazon account. This means that you will not be charged for subsequent content purchases made by the gift recipient. Now when the gift recipient opens the Kindle package and turn it on for the first time, he or she will simply need to “waltz” on over to Amazon.com and register Kindle to an active Amazon account. From then on, purchase made for that particular Kindle will be charge to that account for which he or she will be responsible. What if you did not designate Kindle as a gift during checkout and still want to pass it on as a gift? In this case, you will need to de-register that particular Kindle from your account and instruct the gift recipient to re-register it to an active account upon receipt. From then on, he or she will be responsible for subsequent charges. Can you give content as a gift to someone who already Own a Kindle? The answer…Since any content that you purchase for a particular Kindle is registered to your Kindle Account and stored in your own personal media library, you will not be able to pass it on as a gift to friend who owns another Kindle. At present, Amazon is not set up for that kind of transaction. One way around it is to give your friend an Amazon gift card and tell him or her specifically that it is for purchasing content for his or her Kindle. Or, you can sit with your friend at the computer online Kindle store, have him or her log in to their account, make a purchase with your credit, remove your credit card information from their account, then the can download read and enjoy. As you can see, transferring content from Kindle to Kindle is an issue. Its synonymous with buying a book and after reading it loaning it to a friend. And since the book is yours, you should be able to do whatever you want to do with it. Right? Not quite…The question is, will Amazon allow you to do this? The answer…yes and no. Yes, If they can charge you a fee that is somewhat equivalent or close to the cost of the book for the transfer. And no…if they have to do it for free… just think about it. If they allow free Kindle to Kindle transfer, It will just be like giving away free books to the public. If that’s the case, then I would not need to buy any books from my Kindle store, All I would need to do is just get a Kindle and have my friend transfer all his books to my Kindle – for free. That is simply not going to happen. Ebay Sellers Taking Advantage of The Kindle Shortage (Updated). Update: Kindle in now in stock and is being shipped immediately! While there are many genuine Kindle buyers out there waiting in line for the arrival of their “beloved” Kindle, there seem to be others simply looking to capitalize on this “strange” Kindle shortage. Just take a moment and hop over to Ebay.com and you will see what I mean. Ebay Kindle sellers are popping up everywhere. They seem to have found their way to the front of the line, bought quite a few Kindles, and is re-selling them at exorbitant prices. But, are they responsible for the shortage? And why would anyone in their “right mind” want to buy kindle at such inflated prices when they can simple order via Amazon.com for $399, wait a short while, and have it delivered at there doorsteps? The answer… Kindle makes the perfect holiday gift…and with Amazon out of stock, Ebay sellers get to name their prices. But, is there a backlash on the horizon? Will we see a lot or returns after the holiday season? The answer will depend on how quickly Amazon get enough Kindle back in stock. I suspect that if they do it fast enough, we will see a lot of Ebay Kindle returns in January… Stay tuned. Whatever happens, Ebay sellers look to make a “killing.” The longer, Amazon takes to get Kindle in stock, the longer the Kindle line will be get, and the more Ebay sellers stands to profit. That said, if you cannot wait, and don’t mind spending a little extra, you might as well just hop on over to Ebay.com and get your copy. This way you won’t be at a disadvantage should Amazon decide to “drag its feet.” Just remember that you can always return it after the holidays if you think that you paid too much.